My friend says that I can't add -ED or -ING to the end of a word to make a new word (for example, EXIT-ED or EXIT-ING). What do you think? Hi Pam - Any word on the board can be extended by adding letters to the front or back of the word, or even both at the same time. 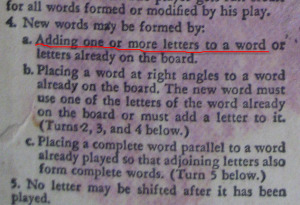 If the word PLAY is on the board, for example, you can legally form the words PLAY-ED, RE-PLAY, or even RE-PLAY-ED in a single move. I've attached a picture of the relevant rule to the top of this post, and highlighted the bit that should clear things up. P.S. If I've misinterpreted the question, or if you have something you'd like to add about this one, feel free to click on the comments link below and have your say.